FAQs • I Painted That! 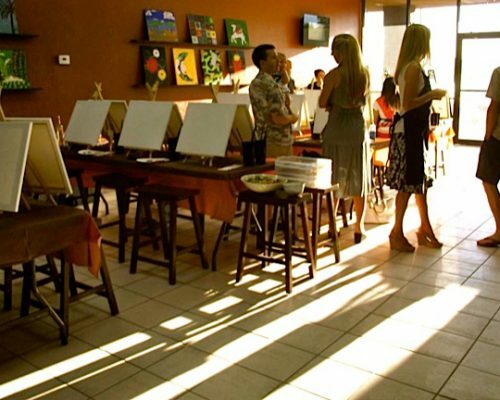 Canvas & Cocktail classes start at $35. Wood & Wine Workshops start at $45. Check out our calendars for events and exact prices. We provide step-by-step instruction plus all the materials needed. 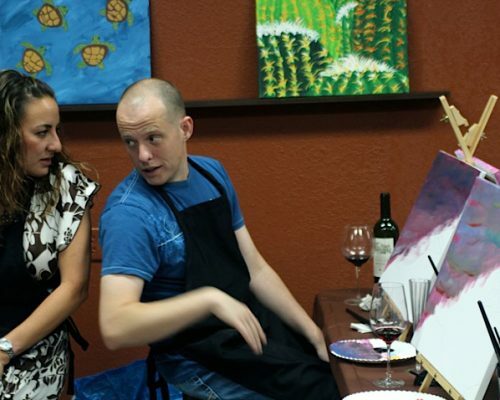 Canvas & Cocktail classes are typically 2hrs long. Wood & Wine Workshops are 3hrs long. Yes, reservations are recommended for scheduled classes. Your reservation holds your spot in the class and gives us time to set up for you before arrival. 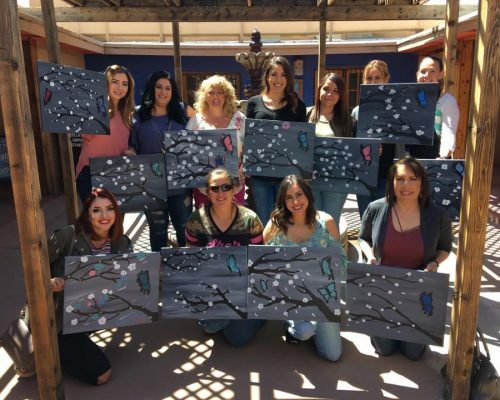 Our Mesilla/Las Cruces, NM location also offers walk-in painting instruction where reservations are not needed. Check our calendars for class times and walk-in (Open Studio) hours. Online is the quickest & easiest way to register! Just click the calendar link, select the location, pick your class and register right there. Once you complete your registration and payment online, you’re all set! Just show up with your drinks and snacks! Will I get to sit with my friends if we sign up separately? We have open seating that is first come-first serve so just sit/save seats together. What kind of drinks can I bring to your El Paso, TX studios? Anything you want to! Wine, beer, cocktails, soda pop, milk, juice, you name it and bring it! We supply wine/beer openers and cups. If you prefer stem and glassware please feel free to bring it. Snacks are welcome too! What kind of drinks can I bring to your Las Cruces, NM Wet Paint Studio offsites? You are welcome to bring any non-alcoholic drinks and snacks! We paint with acrylic paint so wear something you wouldn’t mind adding a little paint to… permanently. Don’t worry, aprons are also provided. What time should I show up for the class? It’s essential to show up on time for your scheduled class. Doors open 15 minutes before the class time. 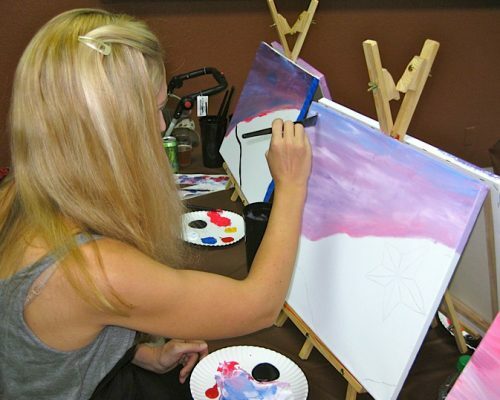 Painting will begin approximately 15 minutes after the scheduled class time depending on the class size. Late arrivals will miss important class instruction and should not expect individual “catch up” instruction from the instructor or assistant. We cannot guarantee late arrivals will be able to catch up and there will be no extension of class time for late arrivals. When do I get to take home my painting/wood sign? You take it with you when you leave. Your creation will be dry enough to take home right away. What if I want to paint something else? 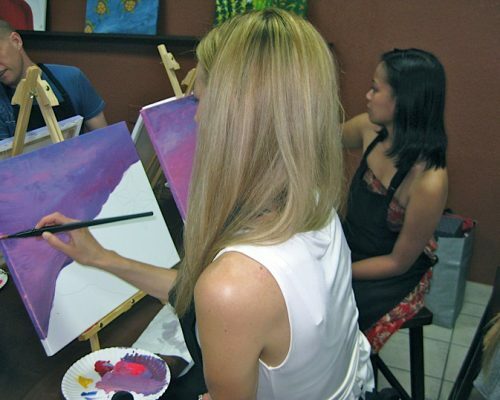 At any of our classes, you are more than welcome to be creative and paint/design your own thing. 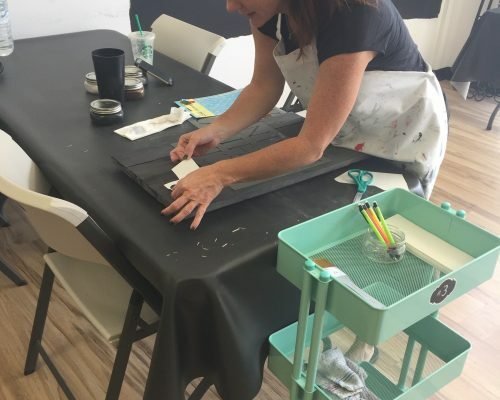 For Canvas & Cocktail classes, you must request a blank canvas upon registration in the comment box. This is not recommended for 1st time painters since the instructor will only be teaching the class painting and will NOT give any other instruction. When do you post the monthly schedules? Schedules are normally posted around the 15th of the month. What is the age requirement for the adult classes? 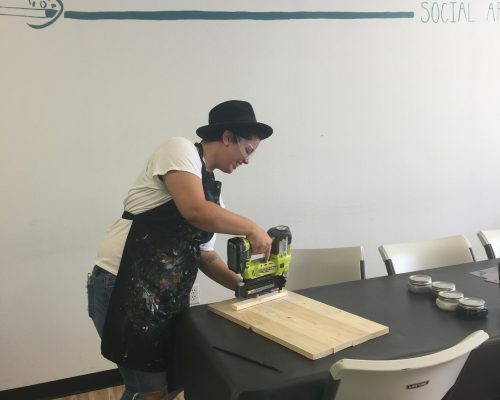 Our Adult Classes are intended for adults due to the difficulty of the painting/wood sign tool use and the adult atmosphere, but we will allow painters aged 13-20 if accompanied by an adult. Can children under 13 years old paint? Yes! Family Classes are offered every so often and are for all ages. Private parties are another avenue to accommodate younger children. 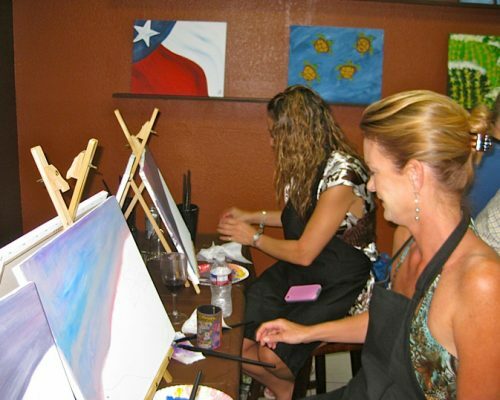 Our Mesilla/Las Cruces, NM location also offers Open Studio (walk-in instruction) that is for all ages. Absolutely not! Our prices are all inclusive. All reservations made online, over the phone, or in the store are non-refundable. However, if you cancel within 48 hours of your class time (this provides us the opportunity to offer your seat to another customer) a store credit will be given. Less than 48 hours cancellation/ “no shows” will not be issued a store credit or refund. Please no excuses, no exceptions will be given. If you registered by phone, the credit card given to hold the reservation will be charged the full amount as reserved. No Exceptions. What are Canvas & Cocktails Classes? 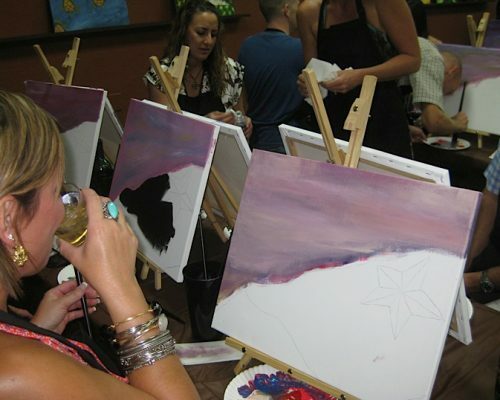 Canvas & Cocktails classes are guided sip and paint classes where our local artist will guide you through your painting step by step. What are Wood and Wine Workshops? Wood & Wine Workshops are workshops where you build, stain, design, and paint your own wood sign. Our local artist will be in the studio to help. These are super crafty classes so be ready for a night of creativity! 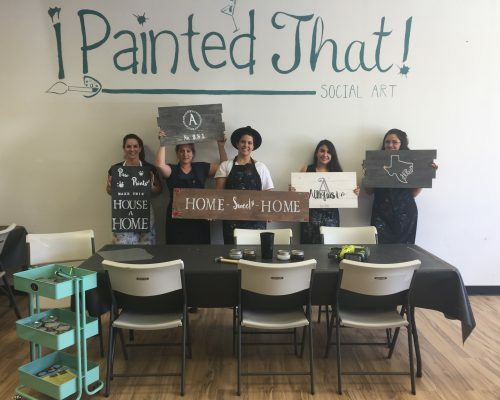 Family classes are designed for families to get together and paint! Everyone must register to paint, no “just watching”. If you have a child younger than 4 years old, they may share a canvas/seat with an adult. Children 5 years and older must paint on their own canvas. 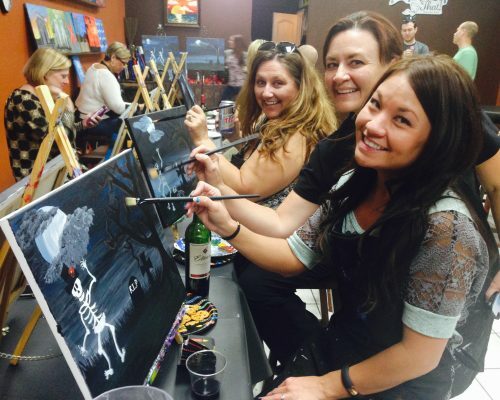 As always, you are welcome to paint the class painting or be creative and request a blank canvas during registration to paint your own masterpiece. 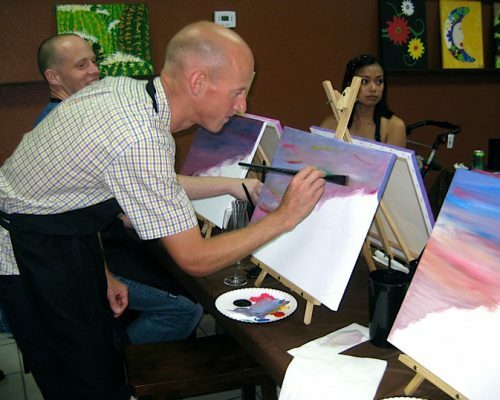 However, the instructor will only be teaching the class painting and will NOT give other instruction. What about classes just for the kids? Occasionally we put together summer camps or holiday sessions for kids where you may drop off your kids to paint. Private parties are another avenue to accommodate classes just for the kids. Yes, please see our private party page for additional information. Could I have a class at my home, church, or organization? You sure can! If you have tables and chairs, we can bring the rest to you. See our Private Parties page for additional information. What is Open Studio/Walk-in Instruction? Open Studio is when one of our local artists are in the studio to offer walk-in painting. Just stop in, pick out a painting to paint, and paint it right then. The best way to purchase a gift certificate is here on our home page. Recipients will receive an electronic gift certificate via email. They can also be purchased in person at our studios, just pop in during any public class. How do I register for a class with a gift certificate? For gift certificates containing a 20 digit gift card code, you can sign up online using that code at checkout. To use a gift certificate that contains a less than 20 digit code, please call and we’ll register you for the class over the phone. What's the Facebook contest to win the monthly drawing for a free painting seat on canvas? After your class just check our Facebook page and “like it” AND tag yourself in the picture that was taken after your class. We will randomly draw the winner on/around the 10th of each month and post their name on our facebook page. Happy tagging and good luck! Yes! As an active duty military spouse, I do my best to offer a discount. A $5/painter military discount is offered at our westside location for classes open to the public on canvas (not valid at private parties). I do apologize, but we cannot offer a discount at our other studios due to recent material and overhead cost increases. We know this may be an inconvenience for some, and hope you can understand that as a small business we are doing our best to continue to support our military families. To redeem your discount at our westside location, just show us your military ID at sign in and we’ll put $5 back on your credit card. We are always looking for new artists and talent. Please email your contact information to info@IPaintedThat.com and tell us about yourself.